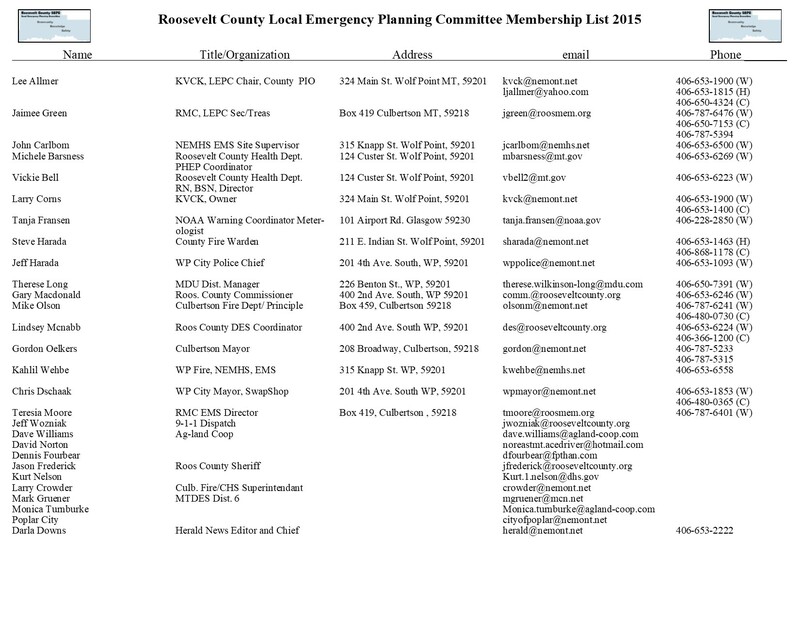 The Local Emergency Planning Committee (LEPC) is a committee consisting of elected officials, regular (voting) members and associate (non-voting) members from across our great Roosevelt County. The LEPC consists of representatives from various groups and organizations including (but not limited to): local government, law enforcement, emergency management, fire services, emergency medical services, environmental, hospital, media, transportation, emergency planning groups, as well as various community groups and the general public. Local Emergency Planning Committees (LEPCs) are community-based organizations that assist in preparing for emergencies, particularly those where hazardous materials are concerned. Under the Emergency Planning and Community Right-to-Know Act (EPCRA), the LEPC must develop an emergency response plan, review said plan at least once a year (annually), and provide information about chemicals in the community to citizens. The mission and purpose of the Roosevelt County LEPC is to provide for the safety of the citizens, visitors, and responders of Roosevelt County from the dangers and perils of Hazardous Materials, as well as planned response to chemical and non-chemical emergencies alike.